How a $199 speaker makes a viable run as your go-to sound system for movies, music and more? In the world of $200 Alexa-enabled smart speakers, everyone is competing with the acknowledged audio quality and multi-room king of this category, the Sonos One. The latest – and perhaps most worthy – contender is the new Riva Audio Concert ($199, due to be released today, on November 13), an excellent-sounding, versatile smart speaker. What makes it more versatile than other smart speakers in its class is an optional battery pack ($49) that lets you tote Concert's audio excellence anywhere you want. If you've never heard of Riva, its origins are firmly based in sound reproduction excellence. The company was founded by Rikki Farr, a legendary British concert promoter and producer who worked with a who's who of dinosaur rock acts who desired to transfer that experience and his love of music to Riva's compact, affordable Bluetooth speakers. Concert is one of two of Riva's new Voice-series smart speakers imbued with Amazon Alexa; the second Voice model is the larger Stadium ($449). 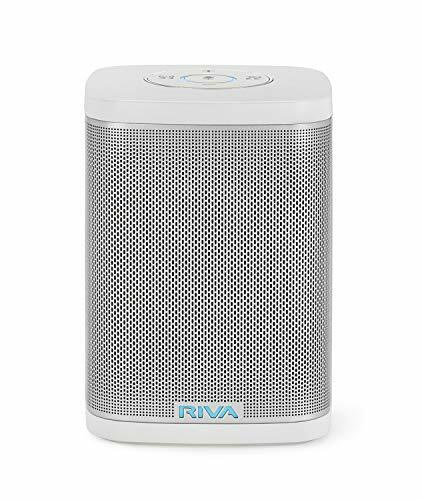 So is the Riva Concert a "better" speaker than the Sonos One? Since each speaker has its pros and cons, which one is "better" comes down to how and where you plan on using your smart speaker. At 5 inches wide x 4.87 inches deep x 7 inches high, Concert is a smidge larger than the Sonos One (4.69 x 4.69 x 6.36 inches); the optional Riva battery base boosts the Riva by an extra inch. Like Sonos One, Concert is available is either white or black – well, gray grill with a black top and bottom – versions. Riva wants to make sure you get the set-up right right out of the box. Printed on the inside flap of said box is an unmissable six-step set-up guide that boils down to "download the Riva app, plug in the Concert, follow the instructions in the app." Set-up is nearly as simple as that; you pair the Concert to your smartphone via the speaker's own Wi-Fi network, then pair the speaker to your home Wi-Fi network. You then pair the Concert to your Amazon account. The whole business took five minutes. When you intone "Alexa," the Riva logo on the front of the Concert lights up rather than a top perimeter LED normal on other smart speakers, which can be an advantage if you're lying down and can't see the top of the speaker. When you mute the speaker, the logo lights red, but isn't bright enough to be a distracting sleep impediment in a dark bedroom. Concert can voice-access Amazon Music, Pandora and Spotify Premium, as does Sonos, and a variety of other music services that can be linked to your Amazon Alexa account. Concert also supports Alexa Calling and Alexa Messaging, but Sonos One does not, at least not yet. With an update, Concert also will include the new Alexa Guard, a new home security feature that lets the speaker listen for and alerts you to unusual noises it hears such as breaking glass, a smoke/CO2 alarm or in-home security alarm. Both Concert and Sonos also let you play music from your device through their respective apps via Wi-Fi, for the Concert, the Riva Voice app for iOS or Android. Concert, however, adds Bluetooth streaming that the Wi-Fi-only Sonos One lacks and an auxiliary-in jack to physically connect a music source, providing a wider range of music access. Concert also includes a unique "away mode," a way to stream locally stored music to a group of synced Riva speakers via the Concert's own Wi-Fi network. You can also remotely push-to-talk voice control a Concert via the Riva Voice app to play songs or adjust the volume from another room. If the spot you want to temporarily place your Concert is AC-challenged, the optional clip-on Riva battery pack gives you around 15 hours of portable listening at top volume. According to Riva, Concert also is "splash resistant" so it should survive pool-adjacent placement, but it doesn't have an official iPXX rating. Sonos isn't so protected. If you're going to carry the Concert around, though, be aware it weighs nearly four pounds with the battery. On the rear of the Concert is a USB jack to charge a smartphone or tablet, functional both if the Concert is jacked into AC or if the optional battery is clipped on. The Sonos One lacks this handy USB charging jack, or any other alternative method of playing music other than via your home Wi-Fi network and its own app. Concert also is equipped with a standard 6mm screw wall mounting jack. Manually, on top of the Concert is a circular array of large manual controls including plus/minus volume, track skip forward/back, and mic mute. What's surprisingly missing is a manual play/pause button. The track back/forward buttons double as press-and-hold pairing and source input switching controls, respectively. By comparison, however, Sonos One includes only a small mic mute touch button, and no on-speaker manual controls of any kind. Riva explicitly states it supports HiRes audio playback up to 24-bit/192kHz, but there seems to be some confusion about 24-bit playback compatibility on the Sonos One. But HiRes compatibility in a speaker this compact is largely an academic discussion that most folks need not worry about. Concert improves slightly on the high-quality tradition of its previous non-smart Bluetooth speakers, thanks not only to improved drivers and other acoustic hardware, but thanks to higher-quality Wi-Fi streaming. Concert's 360-degree array provides a wide soundstage similar to not only the Sonos One but the circular Harman Kardon Allure as well. After some A-B listening, I found that the Sonos was a bit crisper and brighter than the Concert, and pumped out a bit more volume. I couldn't discern much difference in the bass between the two, which were smooth and well-integrated with the rest of the frequencies. Concert lacks Sonos One's room-specific tuning, but does offer bass/treble EQ slider adjustments. Concert present a slightly wider soundstage than a single Sonos One, which, combined with its optional battery, provides more placement options, but Sonos provides one huge soundstage advantage that Concert lacks: two Ones can be paired to create a stereo experience far greater than the sum of its two parts, even more than a pair of wired stereo speakers since both left-and-right Sonos speakers emit 360-degree sound. Sonos Ones also can be integrated into a multi-room system, the raison d'être of the company. Riva says multi-room capability for the Concert is coming, but at this writing there's no way of knowing how it'll work. As noted, whether the Riva Concert is a "better" speaker than the Sonos One is a matter of your usage. Generally speaking, I think the Sonos supplies slight superior sound, especially if you get a second Sonos One to create stereo. But the still excellent sounding Riva supplies far more operational functionality and music source access. For instance, if you want to be able to move your smart speaker around, the Concert plus its optional battery isn't possible with the stationary Sonos One. If you are a user of Alexa Calling, if you want a wider variety of access controls, Alexa features, music source hardware and streaming connectivity options, Concert is a more flexible — okay, "better" — choice.